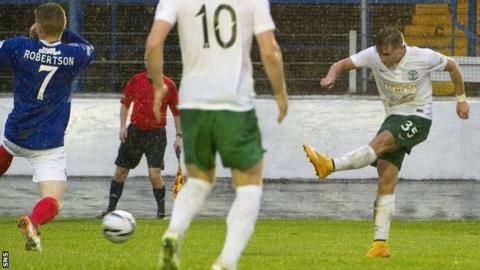 Jason Cummings scored his sixth goal of the season as Hibernian held on to beat Championship strugglers Cowdenbeath. Paul Hanlon got on the end of Scott Allan's cross to prod in from close range after 25 minutes. The visitors doubled their lead four minutes before the break when Cummings smashed in from the middle of the box. Hibs keeper Kleton Perntreou, on for the injured Mark Oxley, produced a fantastic save to deny Lewis Milne before Jon Robertson nodded in. Match ends, Cowdenbeath 1, Hibernian 2. Second Half ends, Cowdenbeath 1, Hibernian 2. Alex Harris (Hibernian) wins a free kick in the defensive half. Attempt missed. Alex Harris (Hibernian) right footed shot from the left side of the box is too high. Substitution, Hibernian. Alex Harris replaces Dominique Malonga. Attempt missed. Lewis Milne (Cowdenbeath) header from the centre of the box is close, but misses to the right. Attempt saved. Dominique Malonga (Hibernian) header from the centre of the box is saved in the centre of the goal. Attempt missed. Liam Fontaine (Hibernian) header from the right side of the box is close, but misses to the right. Substitution, Cowdenbeath. Iain Campbell replaces Colin Marshall. Attempt missed. Calum Gallagher (Cowdenbeath) header from the centre of the box is just a bit too high. Corner, Cowdenbeath. Conceded by David Gray. Jon Robertson (Cowdenbeath) wins a free kick on the right wing. Attempt saved. Jason Cummings (Hibernian) right footed shot from outside the box is saved in the centre of the goal. Attempt saved. Jason Cummings (Hibernian) left footed shot from the left side of the box is saved in the bottom left corner. Goal! Cowdenbeath 1, Hibernian 2. Jon Robertson (Cowdenbeath) header from the centre of the box to the bottom left corner. Assisted by Lewis Milne with a cross. Attempt saved. Lewis Milne (Cowdenbeath) right footed shot from outside the box is saved in the centre of the goal. Substitution, Cowdenbeath. Craig Sutherland replaces Kudus Oyenuga. Attempt missed. Jason Cummings (Hibernian) right footed shot from the left side of the six yard box is too high. Attempt blocked. Dominique Malonga (Hibernian) header from the centre of the box is blocked. Foul by Marcus Fraser (Cowdenbeath). Corner, Hibernian. Conceded by Kyle Miller.